An OIII filter to obtain better contrasts. 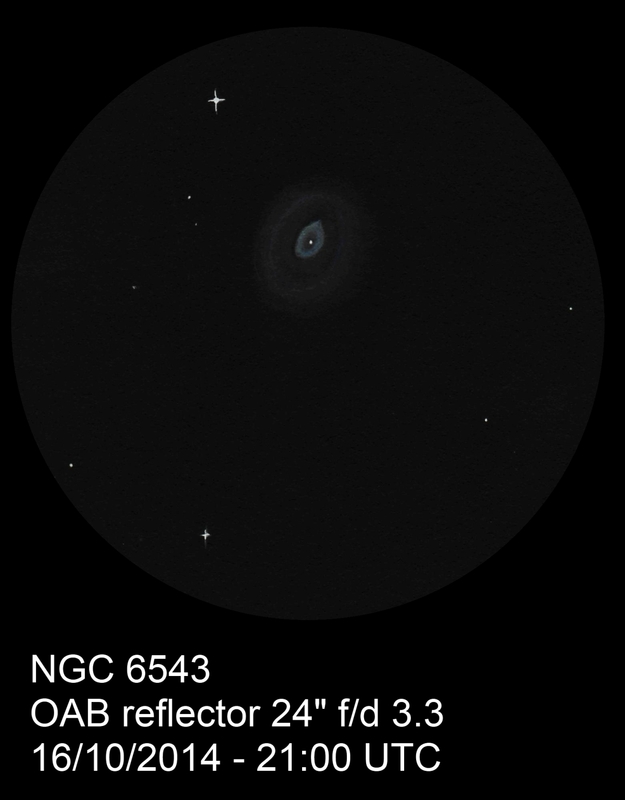 Under a magnification of 240X and the OIII filter the nebulae center darkening is clearly visible. With the same magnification but without the filter we can easily see the central star with direct vision; anyway we are a little dazzled by the close light of the nebula. With a magnification of 120X we can observe the structure of one or two of the outer rings. A 550x magnification allowed me to discern one of the two jets that extend the basic ellipse. This is an impressive capture of the Cat’s Eye planetary nebula. The large aperture scope really helps to pull it in . A very fine sketch here. Wow! There is an impressive sketch here! Thanks for sharing the 24″ huge capacity, and your great tallent.